And Jesus went forth, and saw a great multitude, and was moved with compassion toward them, and He healed their sick. And when it was evening, His disciples came to Him, saying, This is a desert place, and the time is now past; send the multitude away, that they may go into the villages, and buy themselves victuals. But Jesus said unto them, They need not depart; give ye them to eat. And they say unto Him, We have here but five loaves, and two fishes. He said, Bring them hither to Me. And He commanded the multitude to sit down on the grass, and took the five loaves, and the two fishes, and looking up to heaven, He blessed, and brake, and gave the loaves to His disciples, and the disciples to the multitude. And they did all eat, and were filled: and they took up of the fragments that remained twelve baskets full. And they that had eaten were about five thousand men, beside women and children. And straightway Jesus constrained His disciples to get into a ship, and to go before Him unto the other side, while He sent the multitudes away (Matthew 14:14-22). We read the Gospel from year to year, and from generation to generation, in new contexts, in the face of new situations, whether they are historical or personal. And every time one passage or another may strike us in a new way. 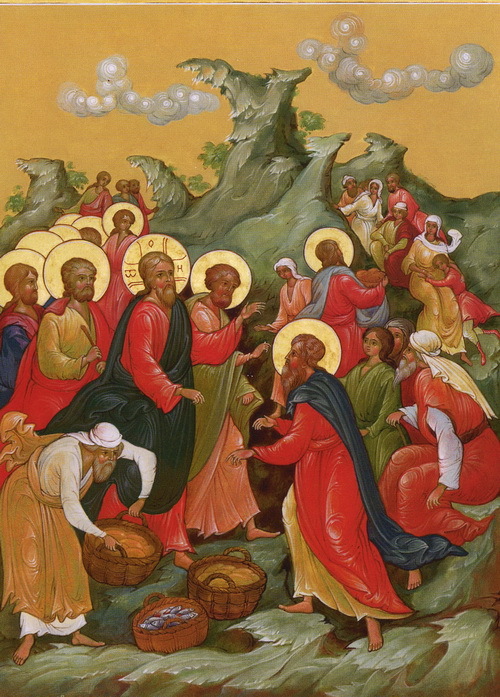 Today we read the passage about the feeding of the multitude by Christ. More often than not the Fathers and the spiritual writers express their sense of wonder at the mercy of God and the power of God who could feed so many with so little; who could indeed work miracles within a world so much estranged from Him, as long as just a glimmer of faith, a crack in the armour of our faithlessness allowed Him to act. Reading this passage of the Gospel today I was struck anew with the words of Christ. 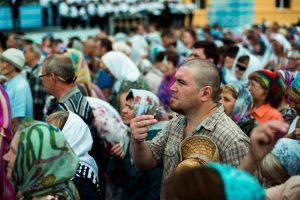 The disciples call upon Him to send away the multitude because the day is spent, the distance to the neighbouring villages is great, tiredness will overcome them, and darkness if they stay longer, for they have not eaten all day listening to the life-giving word of Christ. And Christ says to the disciples: No, they need not depart, give them you to eat. How can they feed a multitude of that kind? A thousand men, women and children, when all they have is five loaves of bread and two fishes. And here is Christ’s challenge to them, and to us. Yes, in a way, God alone can perform this miracle; but not if we contribute with openness of heart, with an open hand and all we have. 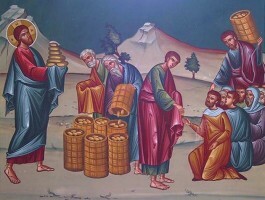 He did not say to His disciples: Keep as much as you need for yourselves and give the rest, your leftovers, to others; He said: Take all you have, and give it all. Is this not something that the Lord says to us now in a very special way, in these days when we are so secure, so rich, so opulent, and when we hear day after day of the hunger, the misery, the death, indeed, from starvation of thousands and thousands of people? And what the Lord says to us is simply: Give what you have and let Me act afterwards; do not ask Me to work a miracle where you could do the thing yourselves. 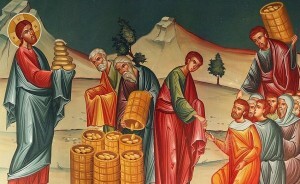 The Apostles could do little; they could share only five loaves and two fishes, but we can share so much. If our hearts were open, and if from hearts of stone God had made hearts of flesh within us, if we had learned anything of generosity and of mutual responsibility, if we had learned a little about loving our neighbour actively, there would be no hunger in the world. Today’s Gospel says to us, ‘Look around you’; look at every person who is hungry, every person who is homeless, every person who is in need, and remember that each of these people is your responsibility, that all their hunger, their homelessness, their misery is ultimately the result of your opulence, your comfort, your refusal to share, to give; not to give beyond your means — just to give. If only we remembered what a certain saint says in his writings, that whenever he eats a morsel which is not a necessity, whenever he acquires or possesses anything beyond his strict needs, he has stolen it from the hungry, the homeless, from the one who has no clothes — he is a thief. Does not this apply much more pointedly to us than to this ascetic? We must reflect on this, because we are behaving like bad, unworthy stewards; there is such a thing as stewardship of wealth, intellectual, moral, emotional and material. You remember probably the story of the unjust, the unfaithful steward who had cheated his master, stolen from him, and when he was to be dismissed by the master who had discovered his dishonesty, he called the people who owed money to his master and reduced their debt. This is something we could learn. He turned to people and gave whatever help he could; we do not. Let us reflect on the words of Christ, ‘They need not depart from My presence in order to eat; you can give them what they need’. If we looked around us, not far beyond the seas, but just round us, at the needs of people who are hungry, who are homeless, who are deprived of rights, or simply our neighbours who are at times so lonely and need a word of comfort, friendship and solidarity, we would begin to fulfil this commandment of Christ. But let us not deceive ourselves; it is not by words of consolation, by kind gestures that we will fulfil it. Christ said: Give all you have. And to us, perhaps, taking into account the little faith we have and the narrowness and hardness of our hearts, He will say: Give what is superfluous in your life; but give some thought to what is superfluous, to what you spend on yourself unnecessarily, without even deriving true joy and pleasure, or any advantage from it. Give it, and then leave it to God to do the rest. This is the judgement of God on me; it is also the call of God addressed to each of you.